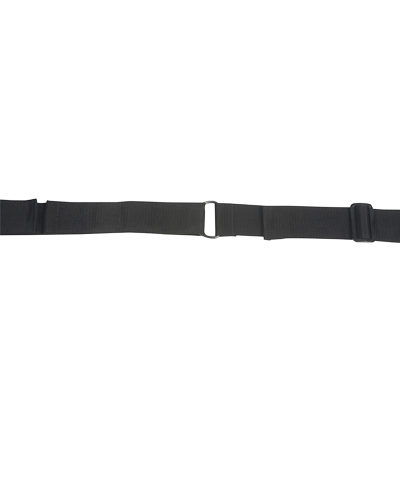 This accessory consists of a,1 ½" wide, two piece thigh strap with a velcro closure. Belt anchors located on each strap can be used for easy mounting to the wheelchair frame or a solid seat insert. This accessory will benefit the client who requires a thigh strap located at a 90 degree angle, on the thighs, in order to prevent extraneous movements of the lower extremeties. The BioForm Thigh Straps are typically chosen when a belt positioned at 90 degrees to the thighs is useful in keeping the femurs in contact with the seat cushion. The straps are available in 1½" and 2" wide webbing with D-Ring and Velcro Closure. The Thigh Strap can be made padded by adding one of the BioForm Padded Sleeve options.